TCS provides students with the opportunities to join a choir (1-4 grade choir and 7-12 grade choir) which perform around the State in different events and competitions. In addition, the choir performs in the Student organized Church services throughout the year. The Choir is lead by a recording artist and music teacher - Kristīne Broka-Meļķe. The bells were shipped to TCS by American Christians. 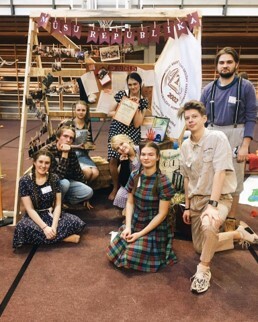 The Bell Choir has several musical partnerships with students outside of Talsi Christian School, allowing the gift to be a tool of ministry in our city. TCS leadership strongly believes in Students’ opinions counting and ensuring their voices are heard. The best means of doing this is through a close and collaborative relationship with the Student Council, providing the students abilities to develop their leadership, communication and planning skillsets. TCS Student council members are elected in schoolwide voting. They must be in good academic standing and exhibit a Christian Character. The council members are role models for the younger students and are held to a high standard and respect in the student body. TCS Student council works closely with other Talsi school Student Councils. Once a year there is a city wide social event put on by all the school councils, in which the best student council is recognized by peer voting. TCS has won this honor in both 2016/2017 and 2017/2018 school year.